Bay Area health officials issued a smoke advisory due to the North Bay fires and advise residents to stay inside. The Bay Area Air Quality Management District issued a smoke advisory Monday as a result of multiple fires burning in Napa and Sonoma counties. Smoke from the fires, which have burned tens of thousands of acres, wafted across the Bay Area due to high winds late Sunday and early Monday, air district officials said. According to AIRNow, air conditions across the Bay Area are ranging between unhealthy and hazardous. Cities near or in Napa and Sonoma County are advised to take proper precautions. 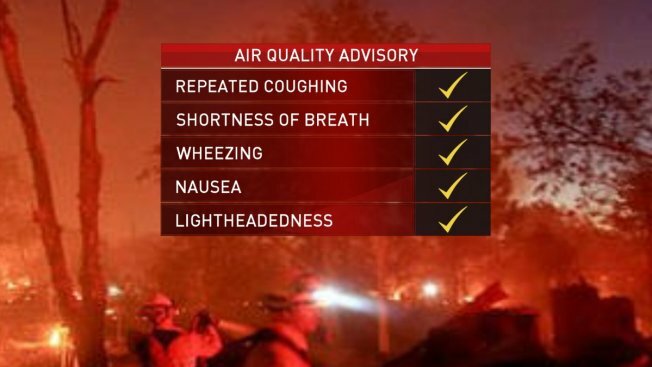 The air quality in these counties are very unhealthy and the population can be affected. Residents are advised to limit outdoor activities and to set air conditioning and car ventilation systems to the "recirculate" option to prevent outside air from entering. If indoors, keep your windows and doors closed unless it is extremely hot outside. According to air district officials, if the home lacks air conditioning, staying inside with the windows closed may be dangerous in hot weather. It is advised that people in these circumstances seek alternative shelter. It is important to keep the fresh air intake closed and the filter clean to prevent additional smoke from coming in.